Aavani avitam a.k.a Upaakarma is celebrated today. Well, to be more precise Yajur Upakarma today. The followers of yajur vedha, brahmin iyer men performs this most important tradition - the changing of the sacred thread(poonool).Incidentally, this time, it has come in the month of "Aadi" (Tamil month previous to Aavani) itself. 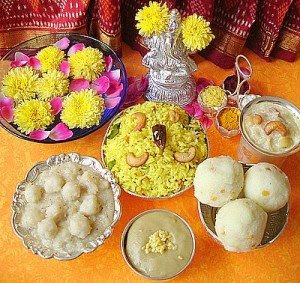 The month of August marks the arrival of the series of Hindu brahmin festivals(actually it's all round the year) that coincides with the opportunity to eat lotsa special dishes that's made specially for these occassion. Today, while i was doing the upakarma and as the sastrigal was chanting the mantras, my mind was filled with the thoughts of my school days when we used to have quarterly exam and the holidays following it during this time. During those days i used to be in my paati (granny)'s place and used to eat all those special dishes that my patti used to make for these festivals. Just for the records, my patti was awesome in cooking and oh boy! oh boy! do i miss her and all those special dishes she used to make. Ahem! coming back to this post, ever since i came home few days back for special "aadi Perukku" lunch, i was dying to post something on the food items that i relish made on these occasions. "Aadi perukku" - the function that marks the arrival of new floods in the river cauvery during the months of July-Aug. This is when, the folks take bath in the cauvery river and pray to the river goddess for prosperity and eat all the special dishes already prepared sitting on the banks. The specialty being those mixed rice varieties - Thengai saadham (coconut rice), Puliyodharai (tamarind rice) and Thayir saadham (curd rice), with Aviyal (mixed vegetable gravy made in coconut oil and with curd), Karudam and appalam (papads), vada and payasam(pudding) as dessert. Then comes the Varalakshmi vrtham and Avani Avittam, the former is a special occassion for ladies where they pray the goddess for long life of their better half or pray for the best better half. The later, is for the gentlemen (refer the first para). Special dishes ranges from idly, vada, kozukkattai (modak) - vella poornam(sweet version made of grated coconut in jaggery) and uppu (salty version), not to forget the payasam as dessert. This is followed by the Krishna Jayanthi (aka Janmashtami). This is a relatively bigger festival at least in terms of the sweets and savories made. Murukku (dough made of rice flour, twisted into circles and deep fried), Vella seedai (dough made of rice flour mixed with jaggery deep fried as small balls), uppu seedai (salty version of seedai without jaggery), Thattai (flat deep fried savory made of rice flour), Appams are all made as naivedhiyams(offering) to Lord krishna, apart from the special dishes like vada, payasam. Vinayaka chathurthi follows, again the elaborate dishes prepared includes idly, vada, kozukkatai (modak) and payasam. Then comes the Navarathri, 10 days of sumptuous eating :-). 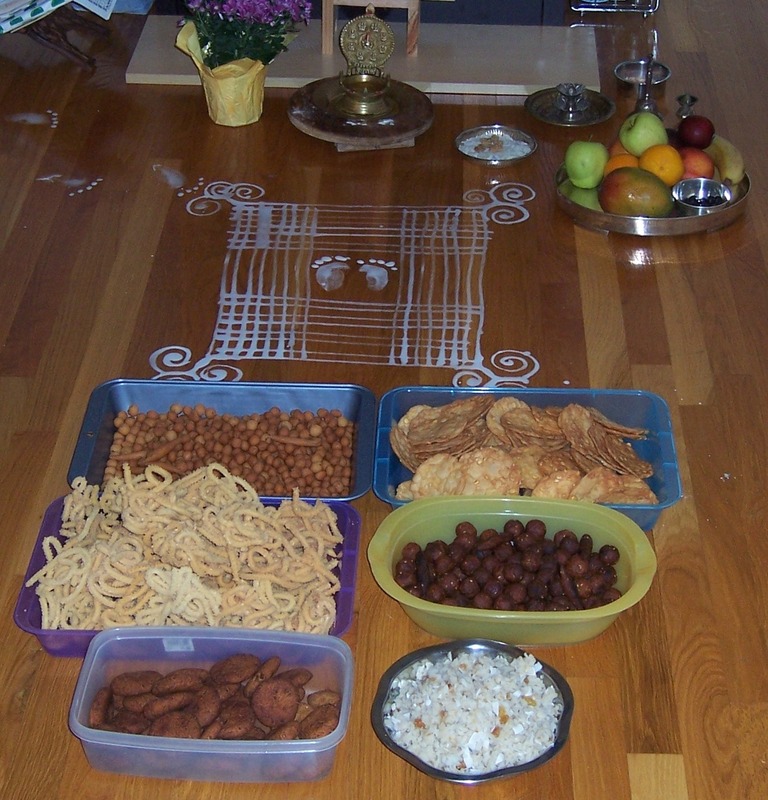 The variety of sundals and puttu along with the elaborate lunch with vada, payasam on the ayudha poooja, vijayadashami days. Already i am feeling too stuffed to write and there are so many other functions where food is the primary specialty. For nothing they say "Brahmana bhojana priya...." (Brahmins are food lovers). P.S: Pics courtesy - Thanks for various sites for the pics. Oh yaa, Brahmins are food lovers and hence the tummy in our community grows much faster than anyone else. @sats- yday i had paruppu poli @ my sister's place.